It's a notion that often inspires a smirk and invites innuendos about under-the-radar romantic interludes. News headlines about these news sites have read everything from "Adulterers Anonymous" to "Naughty pause after work replaces dirty weekend." "Hospitality is looking for new revenue streams," explains Maud Chabanier, general manager of DayUse USA. "And day use is helping them optimize their revenue. Hoteliers are thrilled about it. They can generate 10 to 15% revenue without new investment." "It wasn't planned, but DayUse is coming to market at the perfect time," says Chabanier. "The hospitality industry at the moment is very concerned about all of the market shares that are being eaten away by the sharing economy and disruptive concepts such as Airbnb, and they are trying to find new revenue streams," she added. "We're coming up with a very simple solution - to build revenue during the daytime." "Hotels that start working with us quickly come to realize that financially it's a good opportunity, and it's an opportunity to work with a new clientele they weren't necessarily reaching before," Chabanier adds. ''It's the right time for DayUse to take a big step internationally," says Chabanier. "We're getting demand from users all around the globe and we need to be able to open all of the various large cities around the globe." 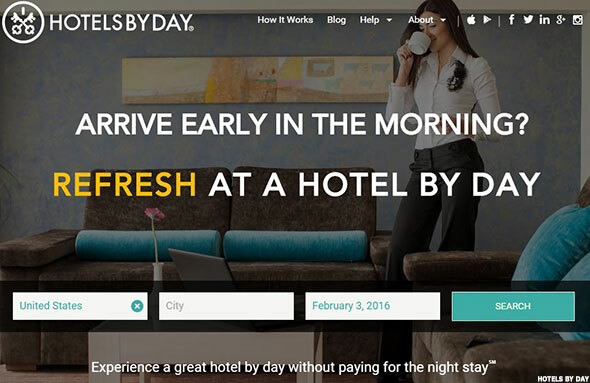 Moati's offering launched a little more than one year ago with the name HotelsByDay. It's a New York based startup run by a team of hospitality industry veterans, technology experts and entrepreneurs. "We're getting pretty good traction," says Moati. "We now have about 350 properties and are growing at about five properties a week." "The European model is geared toward reinforcing the stigma - the romantic aspect," he says. "You can do that when you're selling to the French, Italians and Spaniards. Shamelessly, you can promote a little frill." "We have shifted the mindset to be more about the business traveler and we are reaping the results," he continues. "We see a lot of business travelers calling us who want to book an early check-in or late check-out." "We're breaking barriers," Moati says. "We're changing the model on them. And the most aggressive hotels realize there is an opportunity here. And along the way we're bringing hospitality on par with what modern society expects...We are an on-demand society that moves quicker than ever. But yet the hospitality industry has been stuck with 11 a.m. check out and 3 p.m. check in."